A kitchen and bath industry conversation! This week we will be pinning to our Earth Day group pinterest board, a compilation of favorite sustainable and green designs and products. Let us know if you’d like to be added to the board! 1.) What eco/green/sustainable building tips do you suggest for kitchens and baths? 2.) How can we make kitchens and bathrooms more energy efficient? 3.) What remodeling choices affect indoor air quality? Please share good solutions. 4.) What user habits in the kitchen or bath can help with environmental responsibility? 5.) What eco-friendly products are on your list which can reduce the impact of construction on the environment? by adding #KBtribechat to your tweets! Here’s the transcript for this #KBtribechat. The Best of Dwell on Design! Dwell on Design, America’s largest modern design event, takes place this week. When we return next week, we will be eager to share our insights on the emerging trends and new products we discovered. Sponsor and host TOTO USA will lead our June 26th discussion on KBTribeChat. Join us from 2 to3PM Eastern Time on Twitter by adding #kbtribechat to your tweets. What top new products did you find at Dwell On Design? What booths were the best? What color trends did you see? What green products did you discover? Here is our group Pinterest board for this kbtribechat. TOTO USA is headquarters for the Americas Division of the TOTO Global Group, which was established in 1917 with the founding of TOTO, Ltd., in Kitakyushu, Japan. TOTO is the world’s largest manufacturer of bathroom fixtures and fittings with $5.1 billion dollars in annual sales. For nearly 100 years, TOTO has been the recognized leader in performance, innovation and design with products that enhance the luxury bathroom experience. Today, the company maintains 23,500 employees in 69 offices around the world and owns manufacturing facilities in Japan, Mexico, the USA, China and Europe with an affiliated network of more than 80 production facilities worldwide. With over 1,500 engineers on staff and three centers devoted to research and development, TOTO is dedicated to engineering products that respect the environment while meeting people’s needs for comfort, beauty and performance. TOTO’s corporate philosophy – People-First Innovation – is the guiding principle for all the company’s processes, from engineering and design to manufacturing and sales. Consumers enjoy the peace of mind that comes from knowing they purchased a brand that innovates to improve people’s quality of life. Winner of numerous domestic and international awards and recognitions, TOTO is the only plumbing manufacturer honored as Water Efficiency Leader by the U.S. Environmental Protection Agency. The company continues to raise industry standards and consumer expectations as to what is possible in the bathroom, as TOTO believes a high-quality bathroom is an experience and an everyday luxury people value and appreciate. Learn more about TOTO here. The kbtribe will be living it up in Las Vegas on Jan. 23, 2013, as we report on new products, hot trends, top booths and more from the floor of the 2013 International Builders’ Show. Industry friends can “TweetUp” with fellow chat attendees in the @FormicaGroup booth (C5047) while those unable to attend the show will receive a comprehensive show overview during the 2 p.m. ET/ 11 a.m. PST #kbtribechat. So, join the kbtribe and @FormicaGroup … we pledge that what happens in Vegas (at IBS) will not stay in Vegas! Here is the transcript for this chat. 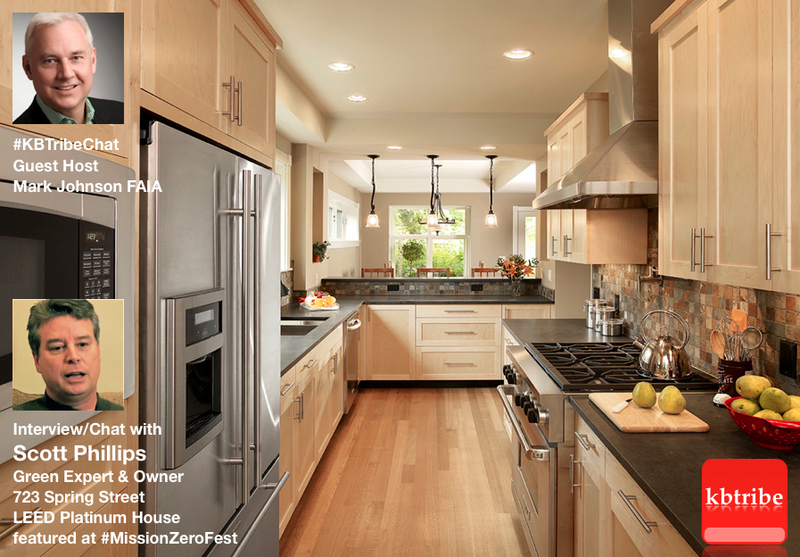 Join guest host, Mark Johnson FAIA, on Wednesday, June 6, 2012, for #kbtribechat LIVE from the 723 Spring Street LEED Platinum home in Ann Arbor, Michigan. Mark will be talking with Scott Phillips, green expert and owner of the home. Scott’s extensive background in the building products industry will inspire our discussionabout the home’s kitchen and bath products that optimize water savings, reduce and monitor energy use, contribute to LEED points, and have led to his family’s adoption of a green lifestyle. This #kbtribechat will incorporate a multimedia offering of resources including videos, photography, a Pinterest board, and downloadable Google SketchUp 3D models of the home and interiors. 723 Spring Street became the City of Ann Arbor’s ﬁrst LEED Platinum house. It is designed to weave into the surrounding neighborhood in style and function, while showcasing many different types of green building methods that make the home ultra-efficient. In addition to ICF Construction and Geo-thermal Heating, the home also has an 8.6kW solar array and is near net-zero energy usage. Advanced building techniques and sustainable products abound in this lovely home. Don’t miss this exciting #kbtribechat. NOTE: If you are in the Ann Arbor area on June 9-10, the 723 Spring Street home will be open to the public during MISSION ZERO FEST, along with the Mission Zero House, America’s oldest historic rehab/retrofit home to reach net-zero energy usage. Join guest host, Mark Johnson FAIA on Wednesday, February 8, 2012, for #kbtribechat LIVE from the Epcot Theme Park at Walt Disney World in Orlando. 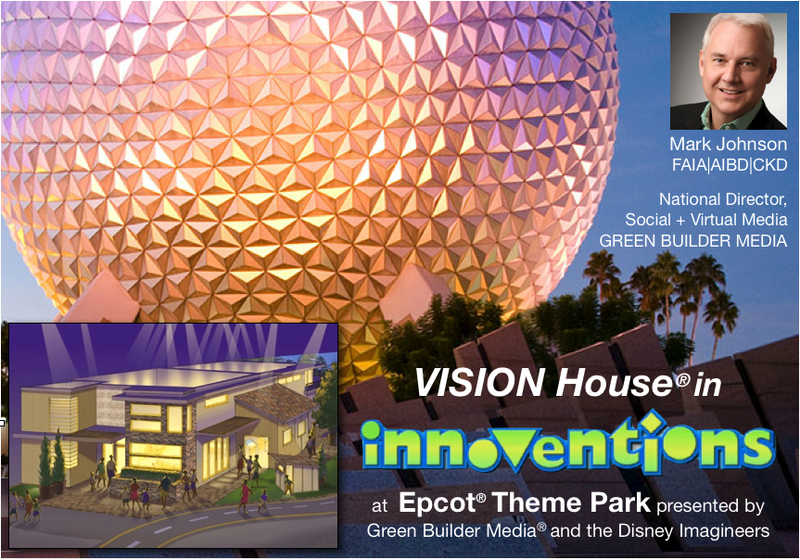 We’ll be taking a look at the The VISION House® in INNOVENTIONS project site, the sustainable products being used, and learning more about this exciting demonstration home opening on Earth Day, 2012. Who knows, maybe we’ll meet a Disney Imagineer along the way? The VISION House® in INNOVENTIONS at Epcot® is a ground-breaking green show home exhibit presented by Green Builder Media® in collaboration with Walt Disney Imagineering. This experiential exhibit in the heart of Epcot® highlights the very best in green residential design and sustainable living. Visitors will leave with a greater understanding of green design, technology, and products as well as a host of sustainable living ideas that they can incorporate in their lives the minute they get home from vacation. Sponsors for this exciting project include Trane and Schlage (Ingersoll Rand brands), Boral, Panasonic, Armstrong, Kohler, Siemens and GM. Click on logos for design inspiration! March 27 at #KBtribechat – Bathrooms That Wow!